Star Trek The Animated Series has a bit of an odd place in Trek’s history. It is still not officially considered ‘canon’ but it was the only Trek on TV in the 70s. Although it was aired along with other children’s cartoons, many of the scripts were well written with somewhat adult themes (some by TOS writers and even one by Walter Koenig). ST:TAS was produced by Filmation who did a number of licensed properties (including Ghostbusters and He-Man). In a new interview Filmation founder Lou Scheimer reflects on his career…including Trek. Although Filmation’s animation did leave much to be desired he Scheimer feels that they were able to more alien aliens on TAS than they could on the live action show: "All they could do was put ears on guys. They had their money problems. But it was as easy for us to do a monster as it was todo a human being." Even Trek was somewhat toned down to make it appeal as a children’s cartoon, Scheimer does deny the rumor that there were plans to give the Enterprise crew teenage sidekicks. Of all the crazy stories you’ve heard, he was not a difficult man to work with. All he wanted to do was do his series, and he wanted to keep it honest, and I did too, because I loved that show. We tried as hard as we could to keep it as close to what Star Trek would have been. The one thing that was interesting was that we used basically the same writers. The only place Gene really got involved — after we did the models and showed him how the stuff was going to work — was that he wanted to be involved with the stories. And it was a gift as far as I was concerned, because nobody knew it any better, and he could now do things with it that we could do before because they couldn’t afford to do it in live action. We could take them anyplace, do anything we wanted to do, as long as it was true to the original. We got an Emmy for Star Trek. It was absurd, really, in a way, because it was not a youngster’s show. We did the same kind of stories, with the same kind of concepts, that were done in the nighttime show. It was the only show I ever worked on that got an Emmy. I didn’t mind getting an Emmy, I was delighted with it, but Fat Albert should have been the first show to have got it. For more on Scheimer’s reflections on Filmation’s other projects read the full interview. We watched it in the clubhouse with all the homies each week! Sorry about the double posting…..
No Star Trek for me this week or Fat Albert and so on…. Very interesting. I really want to buy the DVD set now. I remember watching the show as a kid (I’m 38 now) but I couldn’t remember any of the storylines. I had a vague memory of the trying to use a giant communicator but that was about it. After watching all of them there were a few episodes that I thought really shined but most of the story lines were a little weak compared to the live action (in my opinion). None the less, I am glad that I had purchased the series and have had a chance to revisit a part of my childhood. No if I could only buy a set of the communicator walkie talkies by brother and I had. Thank goodness my dad was a Star Trek fan. I thought about picking up the DVD set of Trek TAS, but then I watched a few episodes that were up on Youtube and I was very glad I didn’t spend the money. I loved watching the show when I was a kid, but now the stories seem stilted and terribly oversimplified. For the most part, the voice acting is sub-par. Kirk’s passionate energy is nowhere to be found and DeForest Kelley sounds like he’s reading his lines into a tape recorder at 3:00am. The animation is also extremely limited, with most episodes made up of the same stock shots used over and over, where only the character’s mouths move, and not always in sync with the lines of dialog. For a kid needing a Star Trek fix in the 1970’s TAS was wonderful, but it hasn’t aged nearly as well as TOS has. I believe it’s best to continue thinking of it as non-canon. 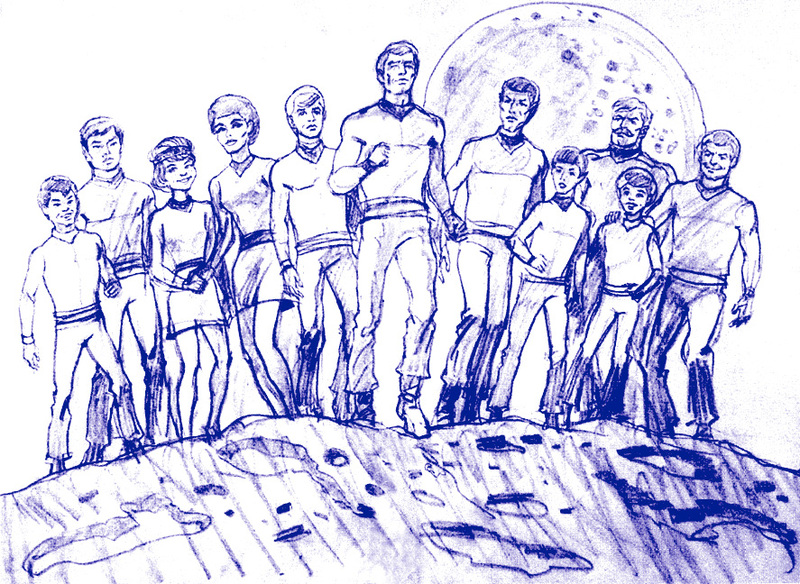 Oh and by the way, Scheimer may deny that there were plans to give the crew young sidekicks for TAS, but there are photos of character drawings for them in the book “The History of Star Trek.” There are even details about how each teenager would be paired with an adult “mentor” crew member. It may not have made it into the final production, but somehwere along the line it was definitely considered. Despite Buckaroo’s critique, TAS was far above the shows surrounding it on those Saturday mornings. I have no problem with parts of TAS being canon. A lot of people look down on the show as if it were beneath them, but I think it did a good job of keeping Trek alive and introing it to the younger minds that became todays adult fans. I enjoy the animated show for what it is, and I bought and enjoyed the DVD set, but “stilted and terribly oversimplified” is right on the nose. Though not a huge fan of TAS, it should be recognised as canon, even if Rodenberry didn’t want it to be. TAS kept the show alive, I watched it when I was a child in the 80’s and liked it, but now, am not so fond of it. TAS introduced a new generation to Trek, and you did not have to have any knowledge of TOS to enjoy, which is a big plus in a way. In retrospect it has alot of flaws and the stories in some cases were very weak, but it kept the series alive and in the mind of Executives at Paramount. Trek should be treated as star wars is, Lucas treats even the fan stories as canon and goes as far as introducing characters from the books into the movies, yet in Trek, Novels by writers of the show are not even treated as such, let alone TAS. I agree with Xai 9. it introduced a whole generation to Trek, and kept it alive. I was 13 years of age when TAS originally aired and I glued myself directly to the surface of my family’s 25″ Zenith during every episode. Now, at 46, I still love the animated series; probably due to the nostalgia. Even with the flaws within the animation, which I now notice, I still enjoy TAS to this day. I agree with The Realist. TAS should be recognized as canon, imho, solely due to the fact that Rodenberry was involved. Five years after TOS was canceled, it was great to wake up one Saturday morning to discovered the return of Star Trek. TAS was, and is, a most enjoyable treat. they should do a TNG animated series. Correct me if I’m wrong here.. (what am i saying? OF COURSE you’ll correct me if I’m wrong… lol) but James T. Kirk’s middle name… Tiberius…. was finally said for the first time in an animated episode. If I’m correct, then we at least owe 1 piece of official canon to TAS. I like the animated series. I like its style and the limited animation does not bother me. Having the voices of the real actors was great (especially with no Chekov). When it comes to Star Trek, I decide what is canon for me, and I say the animated series is canon. And I also say Kirk dying is not canon since I don’t acknowledge the Next Generation or any of the other offshoots as having anything to do with the real series. I’m not saying that people can’t enjoy watching those series (Even I enjoy some of the episodes), I just don’t place them in with the real deal. The animated series I do put in with the real deal. I like the animated series. It has a lot of low-budget weaknesses, but there’s still potential for further exploitation of it. If the clean original voice recordings still exist, they could be re-used and the old drawings could be replaced with CG animation, as seen in countless modern animated shows. One of the reasons the animated show seemed so ‘stilted’ was the lack of expression on drawn characters’ faces. Using TOS as a capture source, that could be dealt with quite nicely. Another problem was the lack of ‘guest’ voices: most of them being done by Jimmy Doohan and Majel Barrett. As a gimmick, actors from other Trek shows could be brought in to replace some of the guest voices. Imagine getting Patrick Stewart to voice Robert April and and Marina Sirtis to voice Sarah Poole, for example! Someone else could do a closer imitation of Bart La Rue’s Guardian voice for Yesteryear. The oh-so-70s music could be enhanced with either stock music from TOS or a new score along those lines. All of the spaceship FX would be great, as the CG models of the Enterprise already exist. There are some damn fine, classic Trek stories in the animated series. A ‘TOS Re-Animated’ project would be a great complement to the TOS Remastered episodes. And yes, I know it would cost plenty of money to rework 22 episodes, but it would get the animated show back out there on the mainstream networks in the slots reserved for modern cartoons. About the “stilted” animation, all saturday morning cartoons of the 60s and 70s were done in a simplified manner as a money saving measure. Star Trek was far from the being the worst example of it. Fully rendered animation was just not a staple at all at the time. As a Spock backstory it was really poignant for the character and somewhat ahead of its time. If you think about it, the story dealt with a child of “mixed-race” parentage trying to find acceptance in a society that doesn’t recognize him as part of it. Something some “mixed-race” children of today experience. Part of the arc of the Spock character was trying to prove himself to his father while still trying to pave his own way through life. “Yesteryear” shows us how it began. If you’re a big Spock fan, you should have this episode with the rest of your Trek DVD collection. One thing that would have made the episode better was for Jane Wyatt to voice Amanda rather than Majel Barrett. But that was another money saving choice. I watched it as a kid in the 70’s and was just as glued to the TV as when the live-action one was on. They did a terrific job with TAS. Like Scheimer said, they were able to create some pretty wild aliens and starships that weren’t possible before. If you’ve never seen any of those episodes, definitely pick up the DVD set (through Amazon via trekmovie.com, of course! ), you won’t be disappointed. Let’s start a letter-writing campaign for them to re-do the animated series with CGI. I think it will happen someday. Leave the animated series alone. It is just fine the way it is. I had never seen TAS until I picked up the DVDs last year (although I did read Alan Dean Foster’s novelizations in middle school). I agree, the animation is so-so, and the music is lacking. I wish they could have at least used the opening theme from TOS. But that is all money issues, and given the fact that they were able to bring back most of the cast for voices, I won’t fuss too much. I am with those who think it should be considered canon…look at Kirk’s middle name, Spock’s hometown, the first holodeck appearance…heck, Uhura actually took command of the ship in one episode! I think it is overall definitely a positive addition to Trek history. Now as for Bem…I probably could’ve done without him. :) But at least he was different than your typical human-alien. But he animated series will always be available in its original form, the same way TOS is. I’m delighted with my animated series DVDs. It’s just that I’d love to see the stories and actors’ voices get attached to some high quality modern animation as well. Incidentally, I agree with your view of canon. For me, TOS, TAS, and movies 1-6 are ‘Original Trek’ canon. I’m not saying the later shows (TNG onwards) aren’t Star Trek, but I regard them as being set in a separate universe, which has a few similarities to TOS. Certainly Kirk, Scotty, Spock, Chekov and McCoy don’t seem a bit out-of-character in their TNG appearances. Indeed, as Robert Justman said, Roddenberry was quite happy to contradict TOS continuity in TNG, so it’s better to consider them as completely separate! As far as I’m concerned, the last thing we know about the original crew is that they sailed off into the sunset at the end of STVI. I also have no problem with thinking of the new movie as being set in another universe. Frankly, it frees up the writers to do something a bit more interesting! Redo it CGI and take out the Filmation stock music and replace it with the stock TOS music…. THAT would be PUH-FECT!!!! It would be just like having a 4th season of TOS! So… how rich are you now, Anthony? Redecorating your bachelor pad to be like the bridge of the E? Reclining on mink tribble pillows? Two shuttles in the garage? Well no one said it was for everybody… It was intended for Saturday mornings in the 70’s and was far above the crap that surrounded it. Weird, are those supposed to be kids or clones? Also, Scotty has a big ol’ moustache. 29 – And, it’s still far better than a lot of the crap that’s on today. I think it’s a great animated series! And I agree it’s head and shoulders over all the other stuff that aired on the same day back then. I own them on DVD and I gotta tell ya…when I watch those, many of them DO feel like they could have been “4th season episodes”. I loved the animated series as a kid and speaking from first hand experience, it was heads and shoulders above ANY Saturday morning offerings on TV at the time. Lot’s of stuff from that era is naturally going to come off as a bit dated. Hell, Forbidden Planet, when I watched it in the 70’s came off dated and it was AWESOME!! Science Fiction takes a little skill called “suspension of belief”. Ya’ know, an imagination. Some people complain about Star Trek a lot, methinks. #30:… Scotty’s mustache there pre-dated the one he had in ST:TMP! Amazing, they were predicting the future accurately. But the kids were something Trek would never have lived down. Re-Creating the animated series in CGI can be done, just look at this example from an aborted video game. If George Lucas can do The Clone Wars in CGI, then CBS/Paramount could redo TAS in CGI. I think there would be a renewed interest after Star Trek Remastered. Hi ARAN. Just think: that game was prepped a decade ago. They could make an animated show even better now! Of all the various Trek spin-offs TAS is stylistically closer in tone to TOS than any other series or any of the movies. A CGI revamp of TAS would be a wonderful opportunity to add what’s missing right now. I guess I’m in the minority here…. As a kid I absolutely hated Star Trek TAS and much preferred Scooby Doo and the very funny Fat Albert, on Saturday mornings. 17. Tom – June 14, 2007 -Re – The spock back story, TAS introduced us to Vulcan City ‘Circle” for want of a better word, this has now been incorporated in TAS Redmastered, so besides Kirk’s middle name another bit of TAS has been recognised as cannon, which is a step in the right direction. Aran, I have always wanted to see some footage from the canceled Secret of Vulcan Fury project. Thank you for posting that link. If we ever meet; dinner is on me. I have several screen caps from the game that was posted to the net some years ago but the trailers escaped me. Great stuff and thanks, again! Perhaps the folks at Trek Movie should do a piece about the game that would have been. I remember being so excited when I saw the first teaser for that game! Thanks for the link to that other trailer, though – I’m surprised I never saw it before. I’d love to see all the other material that was created for that game. I would like to see them re-do the animation with all cgi. I posted the CGI idea on imdb a long time ago (aren’t I smart!). It could be great, as other have said. Use TOS music and CGI, and we’re in! And the next person who uses the word “canon” about Star Trek should be flogged with a geek stick. Star Trek is the adventures of Kirk, Spock, McCoy and company, period. TAS has the voices of nearly all the original ST actors, even if Kelley mailed his in, it is his voice. That makes TAS more “canonical” than any crappy later version of ST. “Canon” refers to church teachings. Let’s not get that serious about all this. You say canon is bad, and we should n’t get that serious about this. I liked TAS, but to say that it is more canonical than any other series just because it used the voice talents of the TOS actors makes little sense in my opinion. Tune every Saturday….As I eat every THINGGGGGGGGG!! Ya…Ya…Ya…gonna drive a RAS – CAL!!! Hey..Hey…Hey!!!!!!! I’m tweaking TNG, DS9, and VOY fans a bit here. There little dog and pony shows were OK TV, but I never considered them Star Trek. My logic is this: if ST is Kirk and Co, and they are played by Shatner and Co, then anything that brings us ST with Kirk/Shat and Co is most like ST, ergo TAS is closer to ST than Picard on his most earnest day. Entirely sensible. And TNG annoyed me in its first moments on the air with “to boldly go where no ONE has gone before.” I knew we were in for a bland PC-athon. Pass. Well, I waited for McCoy to appear, then I turned it off. Just my opinion. TAS captures the feel of TOS very nicely. In some ways, it’s a very ‘safe’ series. It doesn’t do anything particularly new with Star Trek, beyond the odd bigger landscape or space vessel. In that sense, the first two movies represented a bold step, as did TNG in trying to move Star Trek beyond the confines of TOS’ style. But I regard TAS as perfectly acceptable Star Trek. It has a certain ‘gee-whizz!’ quality that was also present in TOS and the various 70s comicbooks and novels.